Maggie is so excited to show her friends the picture of her soon-to-be-adopted sister. She can't wait to show the new baby off. Everyone will love her! But when Maggie brings a picture of the baby to show-and-tell, she doesn't get the reaction she expected. Kimberly says the baby is ugly. Even Maggie's best friend, Sam, admits that the baby has a squished nose, a wrinkly face, and big ears. Maggie is mortified. And now she can imagine how awful it's going to be to have such an ugly sister. She doesn't want to have anything to do with a baby sister with ears like a donkey, a nose like a squished bug and a face wrinkled like an old shoe. When her parents pick the baby up at the adoption agency, Maggie's worst fears are realized. The baby is just like her picture. Maggie wants nothing to do with her. Not even when everyone else is making such a fuss over her. Not even when she is all alone in her crib and crying. Not even when she smiles up at Maggie for the first time? 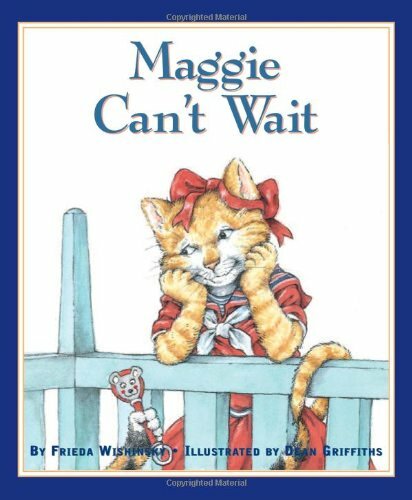 A delightful sequel to Give Maggie a Chance, Maggie Can't Wait again features the little girl with the big imagination as she dreads the arrival of a new adopted sister and learns how easy it is to make up her own mind. About Dean Griffiths (Illustrator) : Dean Griffiths is a published author and an illustrator of children's books. Some of the published credits of Dean Griffiths include Far From Home (Canadian Flyer Adventures).